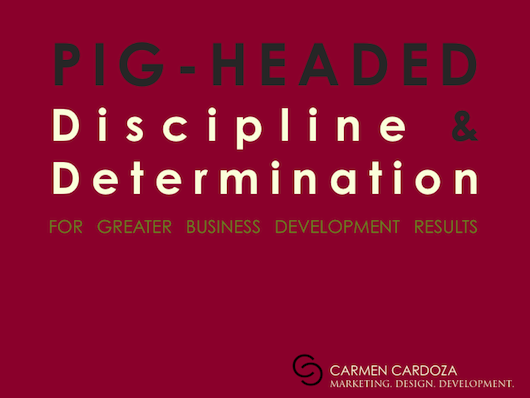 You must apply pig-headed discipline and determination when it comes to marketing, managing, and selling your products and/services, for greater business development results. 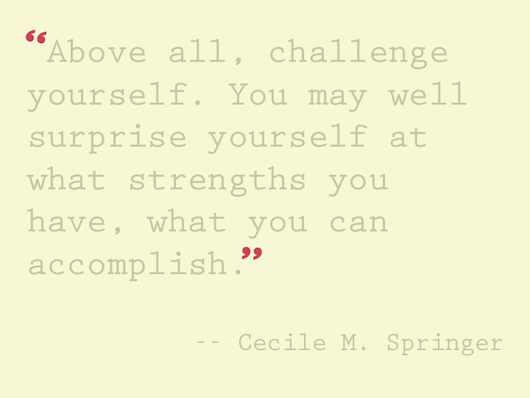 Everyone loves a good quote. 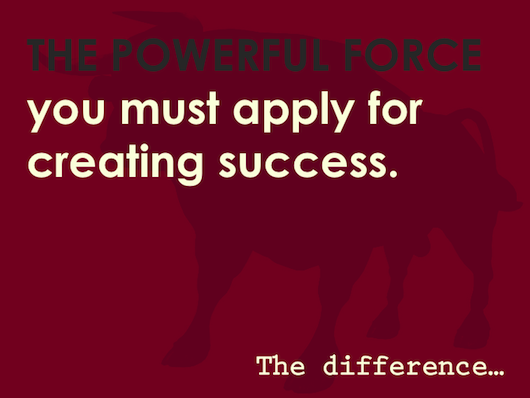 The powerful force you must apply for creating success. 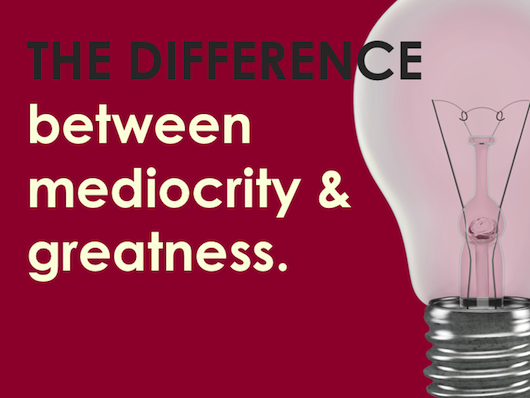 The difference between mediocrity and greatness. 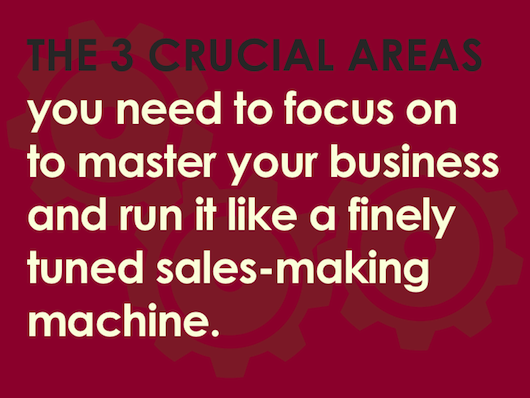 The three crucial areas you need to focus on to master your business and run it like a finely tuned sales-making machine. 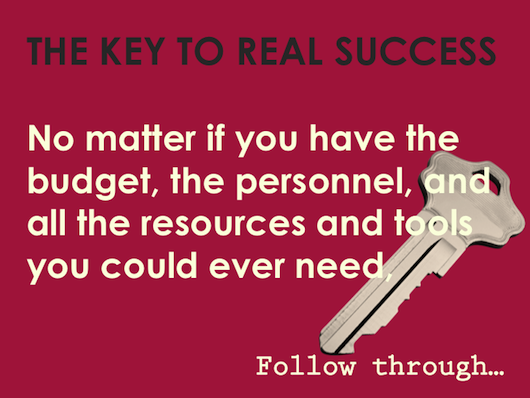 The key to real success. 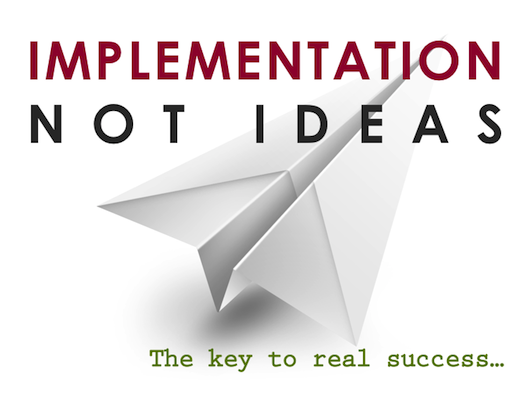 "Throughout my career and via benchmarking projects I have conducted for clients, time and time again I come across the same challenge for many companies, large and small – implementation." 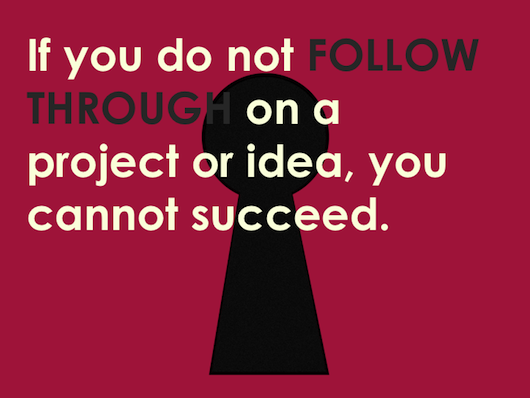 No matter if you have the budget, the personnel, and all the resources and tools you could ever need - if you do not follow through on a project or idea, you cannot succeed - or fail for that matter. 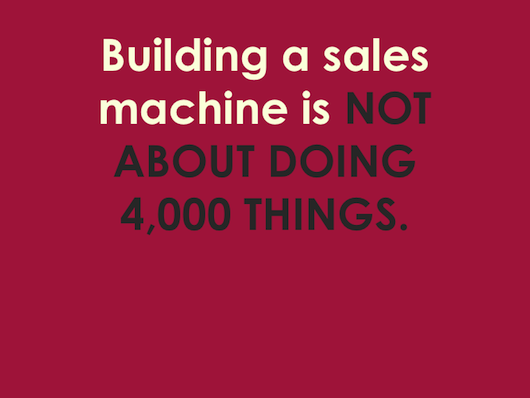 Building a sales machine is not about trying to do 4,000 new things each day. 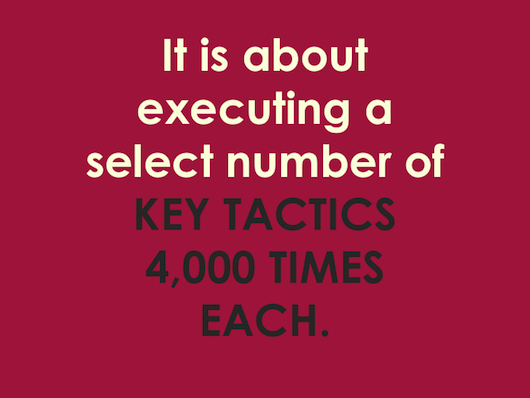 It is about focusing on a reasonable number of key strategies and practicing each of those 4,000 times. 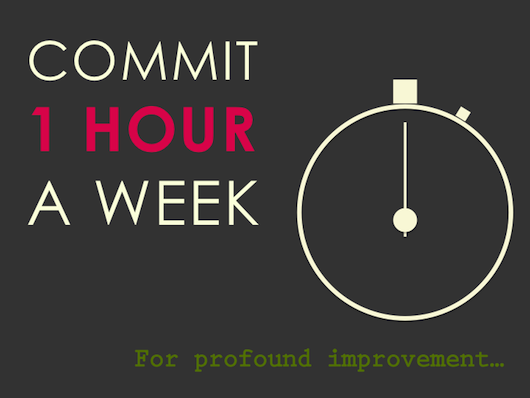 Absolutely commit one hour a week to see profound improvements in your business or department. 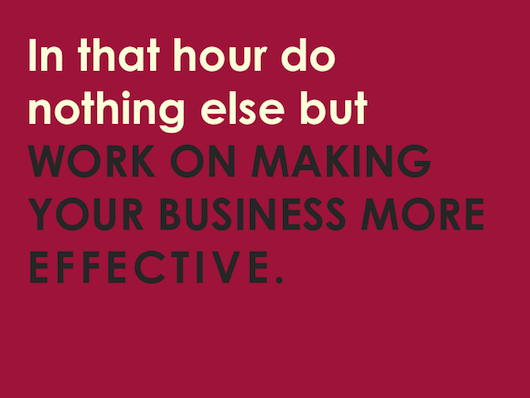 In that hour, do absolutely nothing else but work on making your business more effective. When I was in college one of my study tools was writing things down. Writing what I was hearing, reading, seeing, feeling, and learning helped me digest and retain information better. Years later, I am visualizing my note-taking. As I continue to evolve as a graphic designer, I am finding that those words that I am writing down to remember lessons, key messages, and research data, I now need to visualize. I want to give those words colors and shapes. I want to lay them out in a simple, clean manner. I guess it's my way of de-cluttering and organizing the information overload; putting all the data pieces together and connecting them. 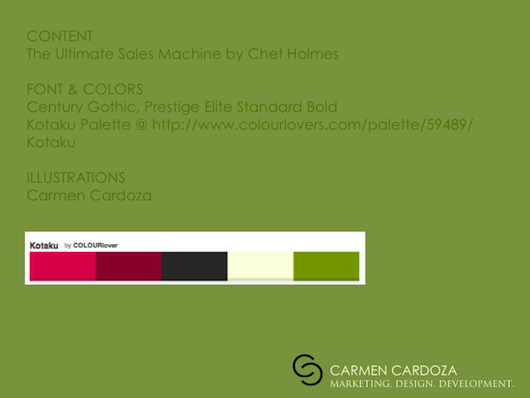 One of my favorite books is The Ultimate Sales Machine by Chet Holmes. Asisde from the title of the book, I really do think the information in this book is fantastic. I think the title is limiting and gimmicky. 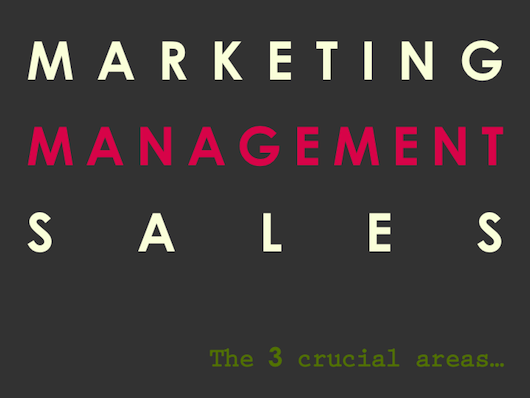 This book is not just about sales. 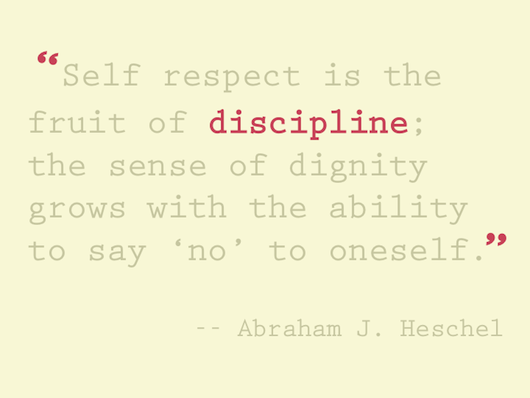 It is about running a business/department. 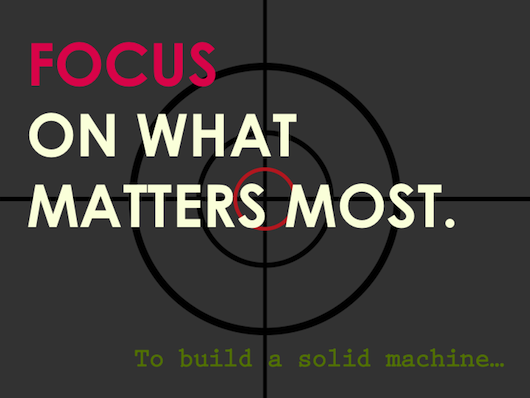 It is about productivity and results in business management. The subtitle: Turbocharge Your Business with Relentless Focus on 12 Key Strategies sits better with me than the actual title. I ran across a review of the book that pretty much mirrors my opinion on the title, but I digress. 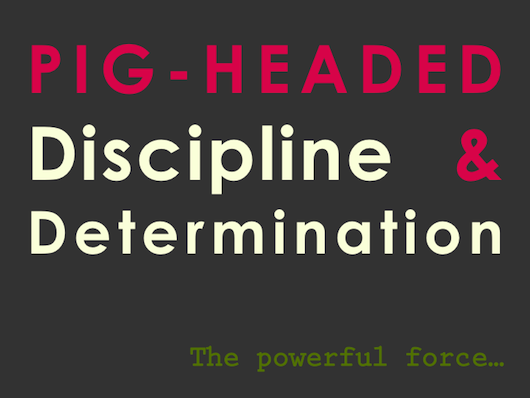 I will be visualizing my notes on those 12 key strategies and sharing them on this blog. Hence, the slide decks. I hope you find them helpful.